This historic Salamanca declaration is one of the early steps towards inclusive education worldwide. It says it all! Ideally, yes. All the children must have access to education and the differences must be valued and accommodated. In our country, Sarva Siksha Abhiyan (SSA) has opened the doors of education to many children. It also reaches out to children with severe and profound disabilities at home, in case they cannot reach the schools. ‘Access, enrolment and retention’ are the key focus of SSA. Implemented in partnership with state governments to cover the entire country, it addresses the needs of 192 million children (www.ssa.nic.in). Initially, SSA was addressing the needs of children in primary schools. Now the scheme has been extended to secondary education as well. As a result, it is expected that a large number of children with special needs will have access to education. In addition, a number of private schools across the country have been trendsetters in introducing inclusive education and setting up resource rooms in their schools to cater to the special needs of children. Though some of these schools work out to be expensive, parents who can afford to give the best to their children at any cost seem to be happy with these arrangements. However, to make inclusive education a reality, a number of pieces in the system have to fall in place. It is true that the Government of India has made a significant fund allocation to achieve ‘Education for all’ through SSA. But to make it happen we need to have the stakeholders suitably prepared and involved. Some of the stakeholders include the regular teachers, special/resource teachers, school administrators, parents of children with special needs and parents of their peers who may not have special needs, children themselves with special needs, and those without special needs. In short, all sections of society who have a stake – directly and indirectly – in children’s education. The success of inclusion lies in the coordinated and collaborative efforts of all of the stakeholders. With inclusive education initiated as a major step, a changing role of special educators is seen to be emerging. The educational programmes of special educators approved by the Rehabilitation Council of India (RCI) prepare the special educators to become special teachers to cater to the needs of children with special needs in special schools. SSA has opened doors for them to be resource teachers in the inclusive education settings, where they are expected to visit regular schools periodically and function as partners to the regular educators in meeting the needs of children who have special needs. We cannot confidently say that they are equipped with skills for this task. As the roles change, the teacher preparation needs to undergo a change too. Perhaps, a short-term in-service programme may prepare them for this purpose, which can be offered by the Continuous Rehabilitation Education (CRE) programmes of RCI. In inclusive schools, though the responsibility of education of all children lies with the regular teacher, the resource teachers are expected to facilitate inclusive education by supporting the children and the teachers in regular schools. In some instances, it is seen that the regular teachers consider that children with special needs are the exclusive responsibility of the resource teachers. It is also observed that the resource teachers often do not communicate effectively or sufficiently with the regular teachers with regard to the education of children who need support. This results in lack of coordination between the teachers, ultimately defeating the purpose of inclusion. Many a time, the regular teachers are not prepared for inclusion. Therefore, their lack of knowledge and skills result in their resistance to change. It is essential that all the stakeholders are prepared suitably to have a smooth, seamless inclusion. 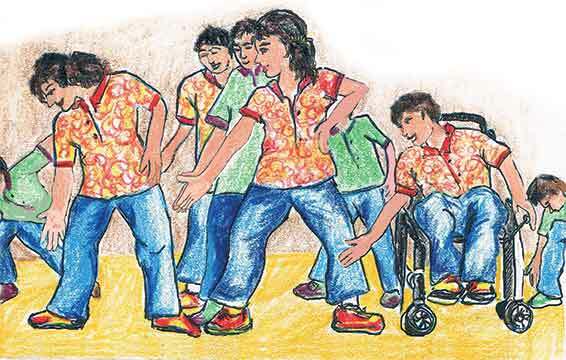 Children with disabilities and their peer group without special needs are to be prepared for inclusion so that the experience is not overwhelming for either of them. Children with special needs who are used to a protective environment with a small class strength of 8 to 10 children may be shocked when placed in a large class of 40 children. And those children who have not seen a child with a disability can react to the situation with varied emotional and behavioural responses ranging from pity and sympathy to bullying and making fun of their peers with special needs. Parents also can have apprehensions if not suitably prepared. Parents of a child with disability may prefer the protective special class to the large regular class where their child may not get attention from the teacher. There have been occasions where the parents of a child without any special needs were afraid that their child might ‘behave’ in an odd manner by being with children with special needs. These are but a few examples of the many issues related to inclusion that need to be addressed, so that inclusion is realized in its true sense. The school administrators are another important component to make inclusion a success. Accessibility to classrooms by providing ramps for wheelchair users, having brightly lit and ventilated classrooms so that children who cannot hear can see the teacher clearly when she talks and the children with low vision will be able to see better, having curtains in class so that a child with attention deficit does not get distracted and look outside while the teacher is teaching… all these are the responsibility of the school administrator, so that accessibility and barrier free environment is ensured. More importantly, the attitude of the administrator will impact the other stakeholders. Therefore, by ensuring that the administrators have a positive attitude towards inclusion, a major milestone towards successful inclusion can be achieved. In short, the Government of India has taken a major step towards inclusive education. To make it a success, all the stakeholders need to do their best so that inclusive education will be achieved in its true sense. After all, it is the right of the child to get the best education. Let us make it happen and bring out the maximum potential in every child – the future leaders of our nation! The author is a special education consultant and former Deputy Director, NIMH. She can be reached at narayan.jayanthi@gmail.com.